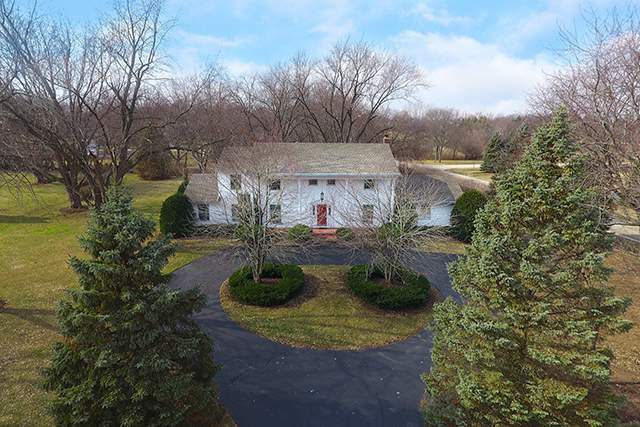 Beautiful Colonial home with lovely curb appeal & dramatic circular driveway. This gem has stunning features including an easy floor plan, huge room sizes, rich hardwood floors & oversized windows with precious views of almost an acre of luscious landscape. Inviting foyer leads to a living room with fireplace or formal dining room with detailed wainscoting. Prepare & serve meals in this huge Chef’s kitchen with island, pantry & an eating area with sliders to deck. Expansive family room has built-ins, fireplace & plenty of sitting options to enjoy stunning views of the outdoors. French doors open to master bed with sitting area, carpeted flooring & luxurious bath with dual vanities, separate shower & jetted tub. Finished lower level with rec room is perfect for entertainment. Grill some bbq on your deck with gazebo & relax with endless nature views. This beauty is in a premier location near Highview Park & Stevenson Schools. All new siding and roof! This home has it all!